Situated at the heart of the Mercantour National Park, the Col de la Bonette connects the Tinée valley in the Alpes Maritime to that of the Ubaye in the Alpes de Haute Provence. The road to the Bonette flies at more than 2,800 meters above sea level in a gorgeous setting. The ascent offers many sensations and is a real delight : magnificent landscapes, green pastures, marmots on the road, streams and waterfalls follow each other in a high mountain scenery. A fairytale which is absolutely worth seeing. The road to the Bonette is linking the Ubaye and Tinée valleys and allows the direct connection between Barcelonnette and Nice. It was originally a mule path, a strategic route operated and maintained by the army as evidenced by the constructions along the road (camp des Fourches, Fort de Restefond). The spanish troops take it during the War of the Austrian Succession (1740-1748). The path is widened and transformed into a road in 1832. The latter is classified imperial on August the 18 th, 1860 by Emperor Napoleon III. The final road is completed in 1960. Some restoration work has been ongoing since 1987. 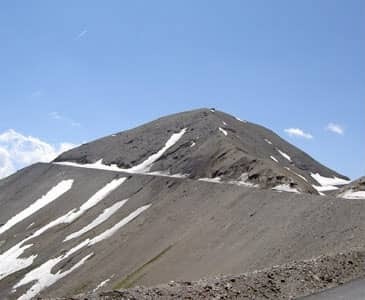 With 2,802 meters above sea level (2,807 m according to the indications of the road), Restefond is the highest obstacle in the Tour de France since its history. The famous “Grande Boucle” (big loop) only passed 3 times through it : in 1962, 1964 and 1993. 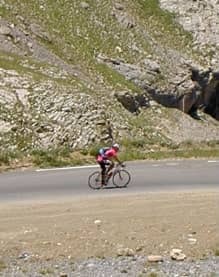 The Tour will cross the Bonette again in 2008. On Tour 1962, Federico Bahamontès (Spain), nicknamed "the Eagle of Toledo”, reached the summit ahead in stage Antibes-Briançon. The Spanish will renew his feat in 1964. That year, he finished third overall in the general classification. The Bonette will be ignored by its organizers until the caravan rediscovers the beauty of the site, nearly 30 years later, during a first time ever stage in the resort of Isola 2000. The Scottish Millar becomes the ultimate winner of Restefond in 1993. The road to Bonette-Restefond flies away at more than 2,800 meters above sea level in a fabulous setting. The vegetation gradually gives way to a lunar landscape, almost unreal, made of grayish loose stones. A total change of scenery. The view at the top is great in clear weather. The summit of the Bonette seems to prevail on neighbouring peaks : Pelvoux, Viso, Mont Pelat, Queyras summits, Southern Alps, the italian peaks. Prefer a visit at sunrise to fully appreciate the beauty of the site, to enjoy a unique light and to meet marmots on the trail or on the road if you are cycling. The highest road in Europe ? Not to be confused with the cime de la Bonette, the Col de la Bonette, also called "col de la Bonette-Restefond (*)", is located at 2,715 meters above sea level behind the Col de l'Iseran (2770 m, the highest pass in Europe), the Stelvio (2757 m) and Col Agnel (2744m). The road to the summit of the Bonette goes round the top and dominates at 2,802 meters. The sign posts announce the road as being the highest road in Europe. The record is actually held by Spain with the road serving the ski resort of Pradollano in the Sierra Nevada in southern Spain. (*) This name comes from the proximity of another pass : the "faux col de Restefond"
The pilgrimage of "Notre Dame du Très Haut" takes place every year at the end of July. A stele was built in 1963 in memory of the exode that took place in the 40s. Villagers who prayed that their home be spared saw their prayers answered. Riding up the Bonette offers many pleasant surprises. 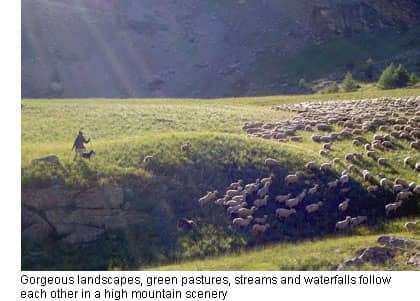 Waterfalls at the bend of a curve, sheep on the road, small lakes and streams, green pastures, snowy peaks and other delights follow each other in a relaxing quietness that only the whistling of marmots, the thundering torrents and the wind modulate. The road to Bonette represents a significant challenge that only good training can overcome. It is a 24 kilometer climb from Jausiers (23 kilometers from the junction) over 1,589 meters (average gradient of 6.6%), 26 kilometers from St Etienne over 1,658 meters (average gradient of 6.4%). 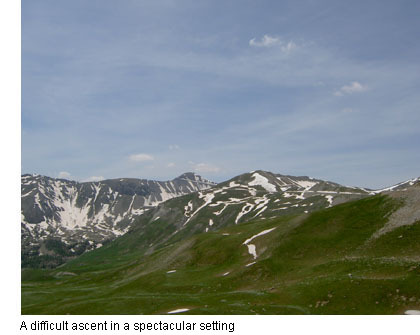 The ascent from St Etienne de Tinée is probably the most difficult because of its length and irregularity of its slope. The ascent from Jausiers has difficult parts but many short sections give you the opportunity to breathe a bit. The last section, 800 meters leading to the highest point of the journey, is literally stunning. The pass is open from June to October. Beware, the stretch leading to the summit can be closed by snow weeks after the pass has been shovelled.